New, different design. Tank-like construction. Distinct tones. Super-versatility. 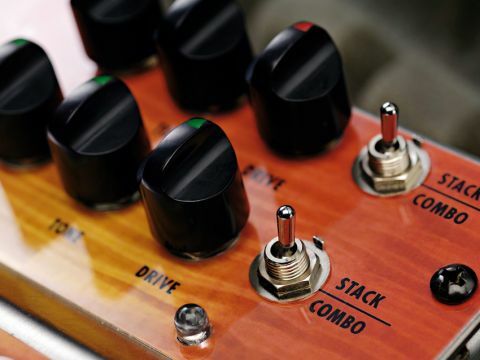 The Double Shaman offers you blues and '80s rock tones in one box. At £225, thispedal is incredible value. "The Double Shaman's LA channel gets you close to those cascaded gains of '80s stalwarts such as Steve Lukather, Van Halen and Slash." "Why bother going into development and manufacture just to have a 'me too' product?" says Rivera of his new range. The controls vary for each pedal. The Double Shaman has two separate channels called LA and Austin, each with gain, tone and level knobs and the stack/combo preset. The second footswitch button is called Destination and swaps from one channel to the other. We used a variety of guitars, a Rivera Quiana and a Vox Bruno 1 x 12 to try out the Shaman trio. All three are exceptionally quiet in use. The Double Shaman features two entirely separate channels. The Austin channel is full of Texas blues, from the cleaner sounds reminiscent of SRV, through to the heavier tones of Billy Gibbons to pick two classic benchmarks. Meanwhile the LA channel gets you closer to those cascaded gains of eighties stalwarts such as Steve Lukather, Edward Van Halen and Slash - it's a fat, JCM800-influenced high-gain lead tone with a hot edge that's great for pinched harmonics. The Combo/Stack switch works much as it does in the Blues Shaman; it's good that you can set it separately for each channel, though gigging players might find the stack setting a little too loose in the melee of loud band mix.